White paper on crime 2001 Part 1/Chap.2/Sec.1/1. 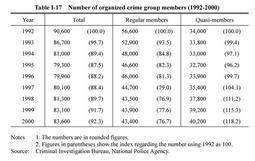 Table I-17 shows the trends in the number of organized crime group members, which include both regular members and quasi-members, from 1992 to the end of 2000. The total number of organized crime group members showed a downward trend from 1993, but started to gradually increase in 1996 and reached about 83,600 persons as of December 31, 2000, up by about 500 persons from the previous year. Among them, about 43,400 were regular members of organized crime groups (down about 500 persons from the previous year). Fig. I-22 shows the trends in the number of incidents of rivalries between organized crime groups that occurred over the last decade and the rate of the use of firearms (the proportion of the number of the uses of firearms to the number of incidents of rivalries between organized crime groups). 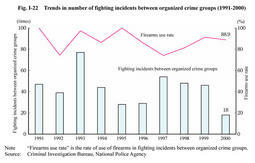 In 2000, the number of incidents of rivalries between organized crime groups was 18 (down by 28 from the previous year) and the rate of the use of firearms was 88.9% (down by 2.4 points from the previous year). As of December 31, 2000, 25 organized crime groups including three major groups (i. e. the Fifth Yamaguchi-Gumi, the Inagawa-Kai and the Sumiyoshi-Kai) were designated as designated organized crime groups under the Law to Prevent Unjust Acts by Organized Crime Group Members (referred to as"Anti-Organized Crime Group Law"in this section). The number of regular members who belonged to the three major groups was about 30,000 (down by about 300 persons from the previous year), accounting for 69.1% of the total number of regular organized crime group members. Under the Anti-Organized Crime Group Law, 2,185 stop orders, whose aim is to discontinue unjust acts, and 95 recurrence preventive orders, whose aim is to prevent recurrence of such acts, were issued in 2000 (source:Criminal Investigation Bureau, National Police Agency).